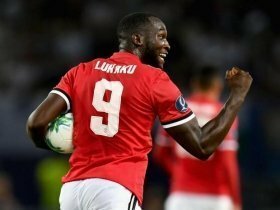 Juventus are reportedly considering a future move for Manchester United striker Romelu Lukaku with Mario Mandzukic likely to be sold out in the next 18 months. Mandzukic has impressed with more than 40 goals in the past three-and-a-half years with the Bianconeri but they are considering his position with him having turned 32 earlier in the year. According to Calciomercato, Lukaku has been earmarked as the leading option to replace the former Bayern Munich man and they are said to regard the Belgian as someone who could lead the line for a long time. Despite the speculation, the United board are understood to have no plans of offloading the marksman in the near future despite the striker's performances not being upto scratch. Lukaku enjoyed an excellent first season with the club where he managed 27 goals in all competitions but he has a tough ask of repeating this feat during the ongoing campaign. The Belgian has managed just six goals during the first half of the campaign and he requires a huge shift at the backend, if he is to come anywhere close to the previous season's tally.